Kristin Claus, now a devoted nanny to the Morgan family, is suffering from acute memory loss. Little does she know that her father is Santa Clause, living in the North Pole with her mother, Mrs. Claus, and mischievous sister, Rudolpha. As Kristin grows closer to the Morgan family the answer to who she is seems ever more elusive. But then a big surprise - a proposal of marriage from Bill! Torn between her love for the Morgans and the life she can't remember, she agrees to marry Bill on Christmas Day - but only if they first solve the mystery of her identity. Back at the North Pole, trouble is brewing. in Kristin's absence, the scheming Rudolpha sets about sabotaging Christmas. To clear the way for a lucrative property deal, she launches a TV advertising campaign to sell off the Pole, piece by piece. Christmas is under threat. Santa could be out of a job! With Christmas fast approaching, Kristin is still struggling for answers. When a bizarre coincidence helps everything to click into place, Kristin realizes that she must again save Christmas or see Santa forced into early retirement! This quirky and uplifting sequel to Once Upon a Christmas, will captivate the kids and amuse the adults. A festive tale with plenty of twists. While still enjoyable... I didn't care for this one as much as the first one. With Kristen having amnesia through most of the movie there wasn't as much Christmas magic in this one. But still... this one is worth watching at least once. Ok... what did I think of this one? Jenny McCarthy... in some scenes I liked her... but yet in others it felt like she could have done better. I was surprised that I liked George Wendt as Santa. Don't get me wrong... I always liked George Wendt... he is always fun to watch... but for some reason he doesn't pop to my mind when I think of Santa. The movie was enough to keep my interest... but not very impressive over all. What would happen if Santa Claus forgot who he was? After a tumble from his sleigh one wintry night, Old Saint Nick (Leslie Nielsen) bumps his head and develops a case of amnesia. Now, it's up to the innocence of a young child and the know-how of a skeptical news reporter to help him find his identity and save Christmas Day. During their adventures, Santa isn't the only one who recalls the magical spirit of the holidays. Another one I recorded off cable just this morning. This one I enjoyed quite a bit. I think Leslie Neilsen was a great choice for an amnesiac Santa. Another one I would like to add to my collection before next year. Oscar Ousts Felix, and in a nightmarish version of Dickens' "A Christmas Carol," sees himself as Ebenezer Madison, haunted by his past misdeeds. 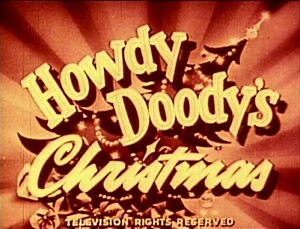 I watched this episode from a Best of DVD called Christmas Treats... it has a Christmas episode of 9 different series. It has been many years since I seen an episode of The Odd Couple. I forgot how much I really enjoyed this show. I will definitely have to add some season sets to my collection soon. This particular episode is a lot of fun. Oscar makes a good Scrooge. 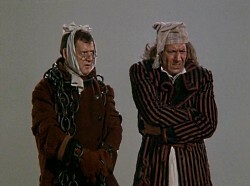 And I had to laugh at Murray as Tiny Tim. For Christmas Felix give Oscar a custom made music box that looks like a trashcan... when you open the lid it plays a tune. For some reason... when Oscar opened the lid... all I could think of was Oscar the Grouch from Sesame Street. Richie (Ron Howard) goes to extremes to receive his Christmas wish: to meet the Wisconsin Cola poster girl. This is a fun episode. I definitely enjoyed it. But as for the Christmas aspect to it... Christmas was really no more then a background for the episode. But I must admit I got a kick out of Arnold in the elf costume to take a picture for Fonzie's Christmas cards. Laverne (Penny Marshal) and Shirley (Cindy Williams) raise money to save the annual Pizza Bowl Christmas Dinner for the less fortunate. I always remembered this to be a good show... but not quite as good as Happy Days... which it spun off of. But I must say... I enjoyed this one just as much as the Happy Days episode I watched. This episode has a few good laughs in it. Lenny and Squiggy providing most the laughs. And the story is actually about Christmas this time... it isn't just the background. Which is always a plus. This is the episode that aired this past Tuesday. It is a good story... I definitely enjoyed it... but unfortunately the whole Christmas aspect of the episode is nothing more then backdrop. 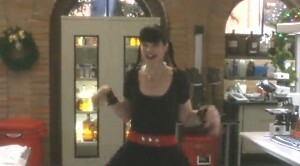 Though I did get a kick out of what DiNozzo did in this episode. 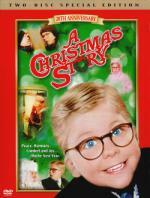 Title: A Christmas Story: 20th Anniversary: Two-Disc Special Ed. The Christmas spirit isn't served up with more observant hilarity than in this beloved adaptation of Jean Shepherd's holiday story. In 1940s Indiana, nine-year-old Ralphie (Peter Billingsley) dreams of his ideal Christmas gift: a genuine Red Ryder 200-shot Carbine Action Air Rifle. But when gruff dad (Darren McGavin) and doting mom (Melinda Dillion) regularly respond with "You'll shoot your eye out!" Ralphie mounts a full-scale Santa-begging campaign. He encounters a slew of calamities from snowsuit paralysis to the dreaded tongue-on-a-frozen-flagpole gambit. We triple-dog-dare you to unwrap a more welcome Yuletide classic! While I have seen small bits and pieces of this movie on cable over the years... this is actually the first time I got to see this one from start to finish. It is a fun movie... I definitely enjoyed it. Though from all the years of hearing about this one... I think I was expecting more from it... and felt it didn't live up to it's reputation for me. But it definitely had some decent laughs in it. OMG... that terrible gift from his aunt... the bunny pajamas... and the fact that his mother liked it so much was scary as well. I do think the story was over exaggerated... but I believe that was on purpose. After all it was supposed to be a guy telling the story about a childhood Christmas. This is more my eldest brother's time then mine. But I have seen some episodes in reruns when I was a kid. But to be completely honest I really remember extremely little about it going into this one. While I see this as really nice for nostalgic reasons... it really is geared 100% to the younger kids. Since I remembered next to nothing about this show to get anything from the nostalgia of it... I really had a hard time getting through this one... even though it is only an 8 minute clip. The one fun memory from this show that I had was Clarabell the Clown. So it was at least fun watching him again. This is one I always make sure I watch every year. I have liked Tim Allen since I first saw him on Home Improvement. So when this was first being released I couldn't wait to see how they did it. I found that it is just a fun movie and for some reason always brings out the Christmas Spirit in me. 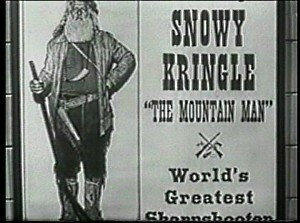 A elderly sharpshooter, Snowy Kringle, arrives in town for show where he will demonstrate his skill with a flintlock rifle and cap-and-ball pistol. The man who is charged with delivering the Army payroll warns the Deputy Sheriff that the old sharpshooter is really a crook and is probably after the payroll. When the express office is robbed, all the evidence points to the old man, but Annie suspects he's been framed for the crime. This is the first time I ever seen any episode of Annie Oakley. But it definitely looks like a show I would enjoy. As I have said many times before I always liked a strong woman... and a female sharpshooter in the old west is definitely that. I enjoyed this show... but for a holiday episode like this it is lacking a little. But taking in account that they are limited with what they can do in a story set in this time period... it is good. I have a 2-disc set of Annie Oakley featuring 12 episodes but I don't think this is one of those episodes. It sounds like a fun one, though. I'd love it if they added this to the Westerns channel I get. But they don't seem to show any of the TV westerns aimed at the younger crowd like this one is. I actually think I rated it a little low... while 3 is a good score (out of 5)... I think 3 and a half would have been better. I went a little heavy on it not being as much of a Christmas episode as other shows are (traditional Christmas)... but like I said... how could it be? Think I will fix that. 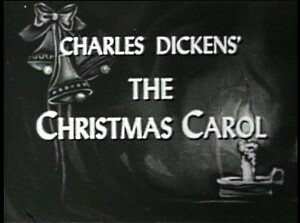 This 1949 version of a Christmas Carol with Vincent Price aired live on US television at Christmas. It's still a magic! I wasn't sure what to expect when I decided to watch this one. My main reason to wanting to watch it is that I am such a big fan of Vincent Price. But when I went to look up a little background info on it before watching it I learned it was only 25min long Christmas special that aired (apparently) live back in 1949. For some reason this concerned me. But it shouldn't have... as I found this to just be a fun and simple telling of the classic story. It has some low production value as well. Even with the low production value I found I liked how they did the ghosts. Which has always been important to me for any version of this story. The only thing Vincent Price does for this show is hosts and narrates it. But it is enough as it does go to him reading the book for short periods through-out the entire story. They did change a couple things that I am not sure how I feel about... like Scrooge's initial reaction to Marley's ghost. I am used to seeing him not believe it and completely ignore the warning... but in this one his initial reaction is belief and fear. Also I am used to all three ghosts visiting him within the one night... but in this one it is 1 ghost per night for 3 nights. I am surprised to say this about a TV Special as old as this one... but this is one I will be looking forward to very much... every year! If you are a fan of this story... and are able to find this TV Special (I got mine in the Holiday Family Collection from Mill Creek Entertainment)... I definitely recommend checking it out!